This month's Kerala kitchen challenge made me a little nervous - it had 12 layers (gulp!) And not only that, I had to come up with a veggie version of it - no meat, no eggs. I was thinking if I should sneak out of this challenge (he he..). After some encouragement from fellow bloggers (thanks Magpie! ), I finally decided to give it a go - all 12 layers of it! And the rest (as they say) is history. The recipe for the crepe called for eggs. But since I was making the specially customized veggie version, I didn't use eggs. I also knew from prior experience that the mixture of all-purpose flour and water (minus the eggs) will be very rubbery when cooked. Hence I added a little bit of baking powder to make the batter a little light. For the veggie filling, I made a dry gravy with mushrooms. I also added fried brinjal in alternate layers. The Indian summers are relentless. The scorching heat saps the energy from all living things. In between the blinding bright days and hot humid nights, there is a longing for the rains to arrive quickly to give respite. The occasional summer rains give momentary relief. But that doesn't reduce the temperatures for long. It seems to get hotter after the summer showers as though the sun is back with a vengeance! Bangalore is supposed to have a more tolerable climate than most other places in India. Unfortunately Bangalore itself is so hot these days. With the heat on the rise, cool drinks and ice-creams gain popularity. One of the favoured drinks during the hot climate is lime soda. I've added another ingredient to this popular drink that takes it to the next level of thirst quenching - a little bit of ginger! 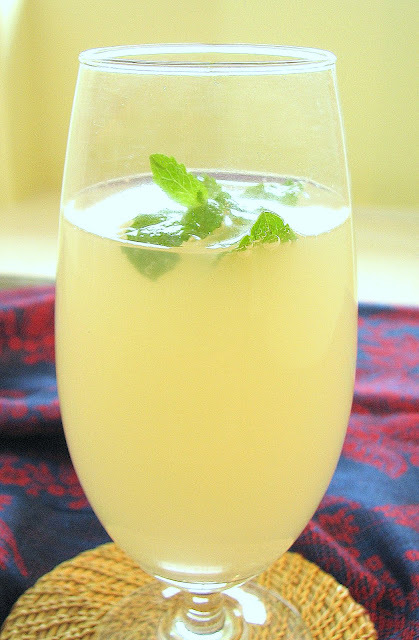 Ginger combined with the fizz of the soda makes this drink perfect for the long merciless summer. There are certain times during the day apart from the usual meal-times, that my appetite is in hyper-active mode. And stuff like fruits and vegetables don't satisfy as they get digested in nanoseconds and leave me just as hungry as before. In such times of immense digestive power, I need something really filling and tasty to stop me from reaching out for junk food. Some of my favourite things to eat then are chicken sandwiches, dosa and sambar, muesli with cold skimmed milk, avalose podi (a snack of roasted rice flour and coconut) with mashed banana and so on. 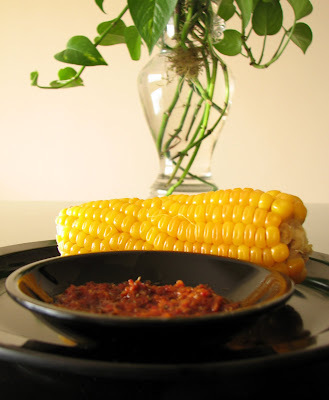 During one such ravenous evening, we were making steam-cooked corn on the cob. That is when my husband reminded me of the corn we used to get at Nandoos - which was served with their yummy peri-peri sauce. Thanks to Latha's recipe, I had attempted peri-peri chicken before and it was a phenomenal success. So I knew peri-peri sauce was an easy thing to make and hardly takes a couple of minutes to whip up. 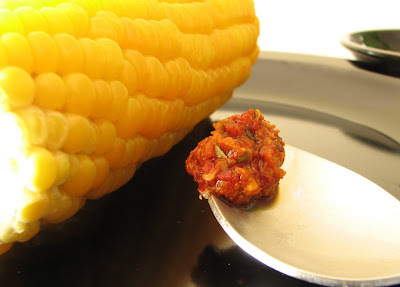 I slightly modified the peri-peri marinade which was used for the chicken to make a lovely dipping sauce (or rather slathering sauce) for the corn. In fact this sauce can be had with fresh vegetables/fruits as well - carrot and cucumber sticks, raw guavas, etc. And even as a tangy, fiery sandwich spread or a marinade for grilled paneer. 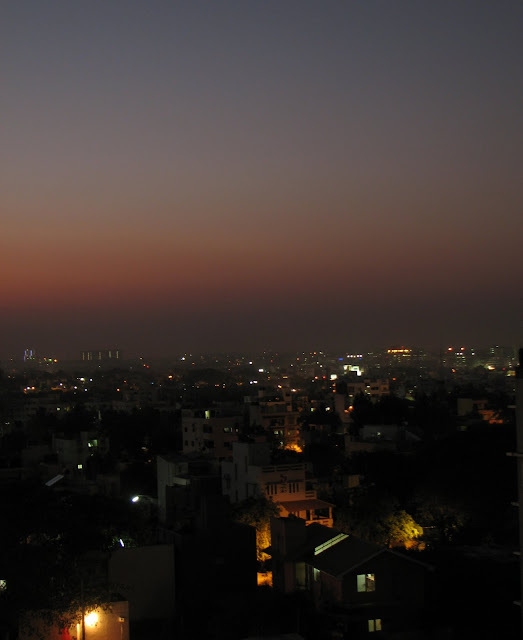 The last couple of evenings in Bangalore, the sky has been really beautiful. Hues of red and blue delicately blending just before being taken over completely with black. The lovely Ambreen from Simply Sweet and Savoury has given an award to this blog. Thank you, Ambreen. 1.Accept the award. 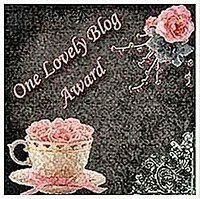 Post it in your blog with the name of the blogger who has given you this award with a link to his/her blog. It was tough to decide to whom to pass on this Award due to the vast number of talented bloggers on the net. Also, since this award is not specific to foodie blogs, I have included some non-foodie bloggers as well. So here are the 15 bloggers to whom I am passing on this award (in no particular order). 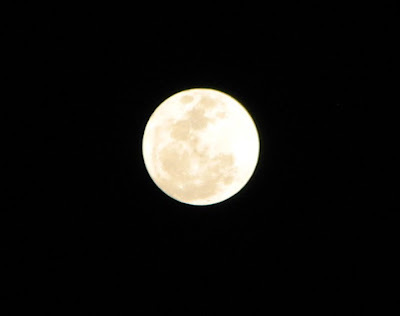 It's a quiet summer night. 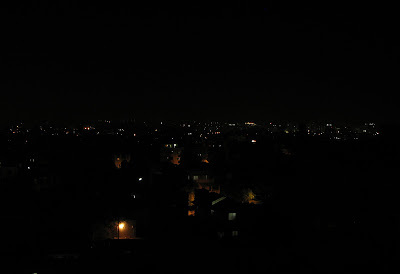 The entire Bangalore city has gone to sleep. I have to admit that I get bored with the same kind of food very easily. And that is the number one reason I love experimenting while cooking. Some of my experiments are downright flops while a few others have turned out much better than my expectations. If the product of my experiments is even remotely edible, I offer it to my poor family :) Just today morning, my husband painstakingly ate up a flop without much complaining. However by the afternoon, the heavens rained its blessings on the unfortunate soul who was being subjected to the trauma of eating not-so-great food without making a face. And hence my afternoon experiment was a huge success. Cutlets are a common feature in our menu at home. The usual ones are meat cutlets. Sometimes, we venture into fish cutlets as well. 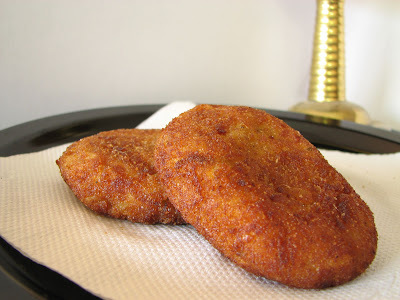 The vegetable cutlet, though it is not un-common, is also the least preferred one. Not because we don't like vegetables. In fact we love our veggies. But for a cutlet, the vegetable cutlets were plain tasteless in the face of other options. And over-spicing our vegetables with all kinds of masalas is even less preferred. Hence the twist to make it taste good. So here are the oval-shaped beauties. I have been riveted to the television and the computer ever since my friend messaged me on Friday afternoon. "Massive Earthquake and tsunami in Japan". The visuals are horrifying in itself. Just imagine what a nightmare it is for the people living through it. Men, women and children scared, separated from their homes and loved ones, suffering and trying to find refuge. As the world witnessed this natural calamity which was of such unthinkable magnitude, all our usual day-to-day tensions and differences seem so trivial. Even though we don't realize it at times, the entire human race is unified in our powerlessness against the fury of Mother Nature. There would hardly be a soul, who after having watched the visuals of the tragedy, wouldn't have uttered a silent prayer or shed a single tear or felt heart-wrenching sorrow for the people of Japan. This was the ultimate test for the earthquake resistant buildings in Japan. And they withstood it thereby saving hundreds of lives which could otherwise have been crushed under the weight of tons of falling concrete. This is also the ultimate test for the courage and strength of a nation. This is a country who picked up the pieces and rebuilt their land after the second world war had ravaged it. That speaks volumes, doesn't it. By the time we convinced our parents to get us a pet dog, we were already past our childhood days and maturing into young adults. After a little research, we decided on buying a cocker spaniel and found a dog breeder named Colonel Sannan who had cocker spaniel puppies for sale. The day my brothers and I went to select our puppy is clearly etched into my memory. We were so excited. As soon as the Colonel opened the door of the room where the puppies were kept, around 10 cute little balls of fur came running. I stood still, savouring the moment. Out of them, one of the puppies came running directly towards me - a gorgeous white pup with a few black spots here and there, her long ears flapping in the wind, her tongue hanging out of her mouth and her little tail wagging. 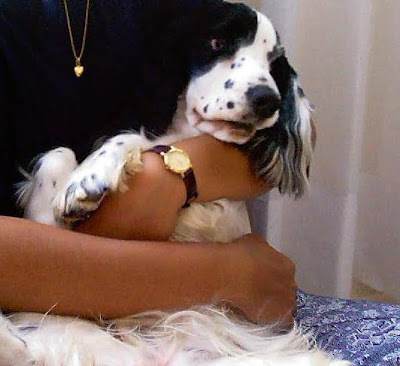 When she reached me, she looked at me for a minute, smelt my scent and then started jumping up at me trying to bite the edge of my kameez which was swaying the breeze. I fell in love with that pup immediately. And so did my brothers. A couple of days after that, my brothers brought her home. This was probably the most stressful day in the little pup's life. As we placed her in the living room, she shivered with fear and very slowly walked across to each one of us and smelt us and the new surroundings. We fed the pup some milk and bread. This was followed by a lot of peeing and pooping all over our house. Within a couple of days, the pup was comfortable with us. She even managed to win over my mother's heart who was actually terrified of dogs before. The pup had tiny black spots around her nose as though someone had sprinkled pepper around it. So we named her Pepper. Potty training took yet another month or so. Till then someone had to keep following her trail of pee and poop all over the house and clean after her. All of us lavished attention on her, played with her, took her for long walks and runs. Each moment spent with her was like a return back to childhood. She loved jumping around and all over my brothers as much as she loved sitting on my lap or being pampered by my parents.